To have a successful online craps game, an online casino website has to provide several key features for the people who want to play craps online. Craps is a game about the action of the dice, and it's a game about the people around the table. 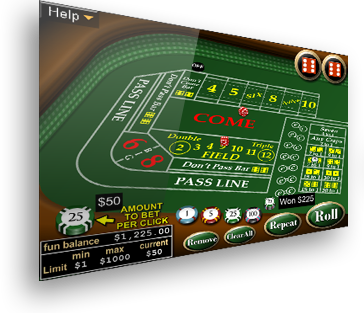 So a good craps game online has to have the best graphics and a really good chat function. You'll see casinos offer lots of online slots bonuses, blackjack bonus promotions, and even video poker promo incentives, but you don't see as many craps bonuses. When you do, they don't tend to be touted as highly, which is a real shame. That being said, there are a number of online casinos that do offer big craps offers to get craps players to sign up. Let's face it, though. Those huge craps bonuses are not for most of us dice gamblers online. Imagine you want to collect a $20K bonus. You're almost certainly going to have to deposit twenty-thousand dollars in the casino to get those matching funds. Then you're going to have to clear some gambling requirement to be able to withdraw the bonus, usually 20x or 30x your deposit plus matching bonus. So you're talking about $40,000 played through 20 times, or a whopping $800,000. I know money is bet quickly when you start gambling, but that's not only out of most of our leagues, but it's pretty much beyond comprehension for a gambler like myself. If I had $20,000 to put into an online casino, my wife would have a new car. Most of the etiquette which applies to live casino craps is done away with in the online version. That's isn't because online gamblers are inherently rude (that's for another discussion), but because the mechanics of the game are so much different. You can't toss chips onto the table in online craps. You usually can't make late wagers or stack your chips in the offensive barber pole formation. There's usually not a dealer to tip, so you don't have to worry about the bad manners of not tipping the boys. You can't drop food and drink on the felt; in fact, it's your home, so you can be as messy as you want to be (I don't recommend it, though). Most of the good manners in virtual craps involves good manners in general, and good online etiquette. If you're using IM or chat functions, don't curse. Don't pick fights with other players. Make your bets in a timely fashion, because people tend to be less patient online than they are in person--or at least more vocal about their impatience. That being said, you're encouraged to chat people up at an online craps table, since that's a tradition throughout the game's history. The mainstream logic on craps betting systems apply just as well in online craps as they do in live dice gaming. When the house has an edge--and it always does--there's no betting system you can devise to beat those odds. You might get lucky and win, but that doesn't mean you have a system for winning. You just got lucky. There are some betting systems for dice that are more egregious and/or widespread than others, so I wanted to address those. The Martingale System will not help you win at craps, and it certainly won't help your enjoyment of craps. The Martingale System posits a betting method where you double your bet after every loss. After a win, the gambler starts the betting over at his initial betting amount. Imagine you start betting $1 on the dice rolls in craps, which isn't very exciting, to begin with. But imagine you bet a dollar and lose a dollar. Then you double the bet to $2. You win the wager, so you cover your initial loss and win an extra $1. Then imagine you bet $1, then $2, then $4, then $8, and lose all four bets. The fifth best is for $16, and you win. You net $1, as that $16 payoff clears the account on those previous $15 in losses. That sounds good, but it's not, unless you want endless $1 wins on a series of bets, and the real risk of ruin. Think about how those bets were doubling after every loss. Maybe you don't mind betting $16 on a 50-50 proposition, or actually a little less than a 50% prop bet. But do you mind betting $32, or $64, or $128? This goes on and on, until the Martingale System has you betting way out of your price range. Bad luck happens in gambling, and it's sure to happen eventually. So even if you have a hundred $1 betting series--and that's by no means assured--eventually the odds catch up to you and you're facing a $128 or $256 bet that may or may not go your way. So the Martingale System means you are going to cover your bets a lot for the big sum of $1--seldom enough to get your adrenaline going--and then give you the occasional hammer with huge betting decisions way out of your betting range. Studies show the Martingale System consistently have a higher variance than standard, reasonable betting patterns. The Martingale is one of many betting systems which plays into the gambler's fallacy. The fallacy is that, if a bet or series of bets have gone against you, that you are "due" for a win. Every single bet in craps is an entirely new proposition, so just because you lost the last 5-10 rolls of the dice, that doesn't mean your odds have increased for the next roll. The odds are the same, every single roll. In my opinion, the warnings I give for craps gambling and casino gambling go double for online craps. Because you are playing with simulated chips and not moving around chip stacks and money, there's a certain surreal quality to gambling on the Internet. By that, it may not hit home quite as quickly that you're playing for real money. With a click-click you can be wagering $512 and blowing it on the goofy Martingale scheme. Don't do that. Enjoy online craps by playing with a system that lets you have some big wins, some big losses, and a lot in-between. Set a limit on how much you plan on losing, and stick to that number. But use a betting method that gives you the chance of hitting on a big win every once in a while. Otherwise, what's the use?